Have you ever dreamed of transforming a food blog into a career? My latest guest on Chopped Podcast, Kathryne Taylor, had that dream and made it happen. If you’re looking for tips and ideas on how to create a food blog that’s ready for the big-time, follow along as I chat with Kathryne, better known as Kate from Cookie + Kate, as she talks about Becoming a Full-Time Food Blogger. I’m so pleased to share with you my conversation with Kathryne Taylor of Cookie + Kate. I met Kathryne last year at the Chopped Conference, and was really intrigued when she spoke about taking the leap to full-time food blogger the previous year. Since she just went through this process, I thought she’d be a great person to share tips on making the transition to full-time blogger. Kathryne talks about how she dedicates her blog to providing great content she knows her readers will love. She also shares her passion for food blogging and some of her favorite tips for productivity, building an engaged community and more. How salsa was an impetus for Cookie + Kate. Yes, salsa! You should check out Kathryne’s favorite Salted Chipotle Dark Chocolate Covered Almonds in the bulk bins at the Whole Foods in Austin, TX. Learn more about today’s guest, Kathryne Taylor on her site, Cookie + Kate. Why not give Kathryne a shout-out on Twitter or Instagram and say thanks for the Chopped Podcast interview. Check out Kathryne’s favorite app, Evernote. Kathryne’s favorite TV Show is The Good Wife. The next episode of Chopped Podcast will feature an interview with Andrew Levine, Head of Product Development and Business Partners for Stumble Upon and 5by. 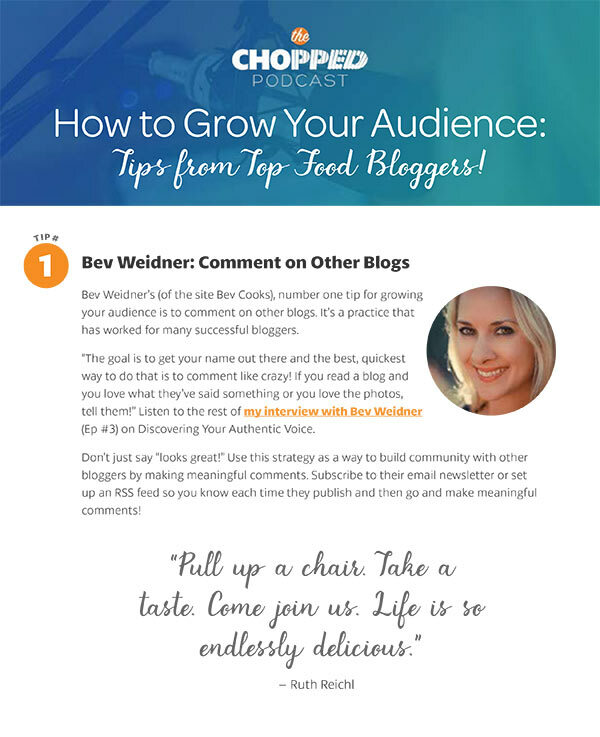 Andrew and I talk about ways food bloggers can use StumbleUpon to better serve their audience and to grow their following. Subscribe to the podcast to be sure you don’t miss it! Kristen, you just made my day! Thanks so much for your feedback – it really means a lot! I can’t wait to see you at Chopped Academy -it’s gonna be GREAT!